It’s been four months since Eiichiro began practicing tennis, but he’s still not progressed very far. He has a contest against the top-ranked male tennis player in the region soon, and is heading into a tournament up against another of the top-ranked players. 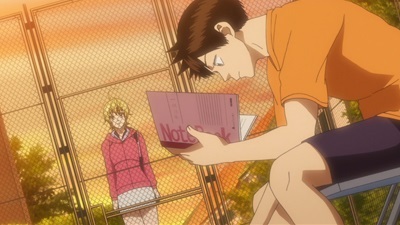 His improvement has been steady, however, and his coach has already discovered where Eiichiro’s natural talents lie and relies on this to recommend that the still-straight-A student compete in a tournament so early in his development. I found myself at several points thinking to myself what all the sports anime tropes are. The early ultimatum-based skills test, the final chance to succeed before being forced to quit the sport forever, the academics suffering because Our Hero is pouring himself into his newfound love…. And this is how Baby Steps saves itself from mediocrity. The visuals are pretty atrocious at times. The soundtrack is still lackluster. But the plot’s subversion of expectations and the focus it’s placing on the character interactions and what “day-to-day life” means to everyone is impressive. It may be difficult for students to divide their attentions between school and recreation, but there’s always a way (and usually a cost. We’ll see if that shows up later). When the contest is held, it’s not to force Eiichiro to leave the sport, nor is it some kind of chauvinistic contest for Natsu’s affections (well, it may have been in a roundabout way, but again, that will have to play out). There’s also much to be said for me, personally, about the relatability of this show. As a nerd who has been known to compete at sports, I’m finding a lot of common ground here that I can absolutely vouch for. Some students are getting jealous of Eiichiro’s ability to balance these two facets of his life. Others are honestly impressed, the fear of losing him to new friends spurring them to some kind of action. As an honor student, one always has to worry about whether the interest of others in your new life is because they honestly care or because they find it quaint and amusing that you’re “trying” to do something as weighty as participating in a tournament. The same goes in the other world, too – a nerd undertaking a sport? What for? Is it just “cute” to watch them try to compete, or do you take their interest in your sport seriously? The support Eiichiro is finding is encouraging, the bridges (and growing fissions) between worlds is absolutely realistic, and the attention to the uniqueness of every player’s approach and path in an individual sport is admirable. Baby Steps seems to be dwelling on all of these issues evenly, and this is why the show remains compelling even next to the shiny “pretty boys participate in (insert sport here)” series that have become more commonplace over the last few years.